After the initial anxieties over weaning and gradual introduction of new flavours and textures over months and months, my girls are now at the point where they eat pretty much what we do. I’m still pretty strict about sugar and salt and keep these types of treats to a minimum but now almost everything is an option. 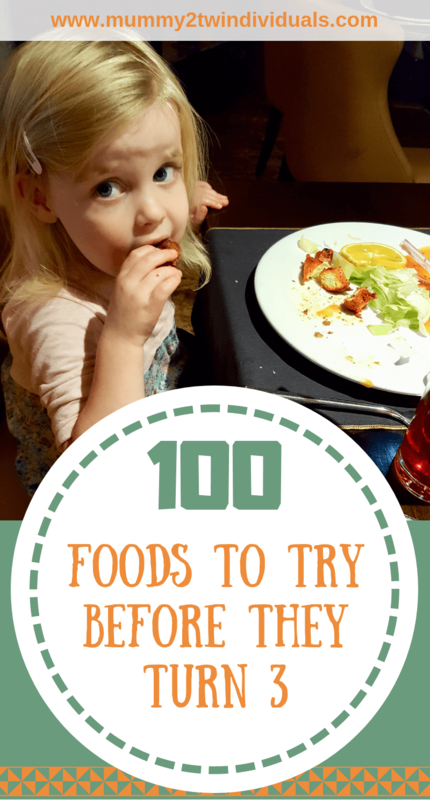 This got me thinking about all the foods my girls have now tried and so I’ve complied a list of 100 foods for toddlers to try before they turn three. A quick disclaimer, I’m no nutritionist and clearly you will know best what your child can or can’t eat. In our house, we offer lots of fruit and vegetables and I believe, because of this, they have a really balanced diet with all food groups eaten in moderation. Below you’ll find a whole range of foods including some that could cause a choking hazard to babies and younger toddlers. Once your child is a competent chewer, these could be introduced but parents must ensure that distractions are avoided and children know they need to chew carefully. I’m sure I’ve missed loads but it was amazing how quickly this list spilled out of me. What foods do your toddlers enjoy? If you enjoyed this, why not read 100 life experiences before starting school. this is a helpful post 🙂 i hope my little one will be able to try all of what’s listed here. we were so much more adventurous with the twins in regards to food. Honestly I wish I could go back and redo the first two kids’ palates. Great post-I worried I’d read it and think arghhh I never did any of these! But I did the majority and its super helpful for those struggling to choose what to feed the kids! Great list! Although the worrier in me is compelled to mention that marshmallows, particularly the mini ones, are actually a major choking hazard – if inhaled there is pretty much no way of getting them out because they’re so light. Also obviously peanuts and cashews need to be chopped. Sorry to preach! I did wonder whether to include but they are new tastes my girls have enjoyed so I added the disclaimer. Great list! I was an obsessive weaning my boys, I had lists and checked off as they tried them. I now have 2 amazing eaters so it was worth it! Olives, tinned sardines and anything with big flavour. They both loved a good curry and weirdly, they both loved chewing on octopus tenticles!!!!!! Children’s menu’s are awful! We live overseas in Tanzania and one of the best parts is that there is no option of processed foods. I’m so glad about it, but I am literally forced to home cook everything. When we visit the Uk my 5 year old usually just has to choose something from the adults menu, luckily he can clear a huge plate haha! You are so lucky to have such good eaters. I hope they stay that way. I have a very fussy eater on my hands and it’s not through my lack of trying. He just will not try anything new and he’s four! I’m hoping he will change his ways when he starts school in September! Thanks so much for linking up to #TriumphantTales – hope to see you again on Tuesday! Maybe school dinners will encourage home to try new things especially when he sees others trying too. Such a great little toddler food “bucket list.” We are only a few months into our food journey, so we are building diversity daily!